The Indochina Wars were a series of conflicts in Southeast Asia from 1946 to 1989. The major conflicts with global impact were the First Indochina War from 1946 to 1954 in which an independence movement supported by China defeated French colonial forces, and the Vietnam War in 1955-1975, in which North Vietnam (supported by the Soviet Union and China) defeated and finally annexed South Vietnam, which was supported by the United States and some of their allies. There were other smaller parallel and later conflicts, within the region. The Indochina Wars began as wars for independence from colonial powers, especially France. They became part of the Cold War, which pitted the Western allies of the United States against the Soviet Union and China (often called "Communist China" or "Red China" in the West in those days to distinguish it from the Nationalist government in Taiwan). They were also ideological conflicts between socialism and capitalism. What is today Vietnam, Laos and Cambodia became French Indochina in the late 19th century. At the time, some realms in the region were tributaries of the Chinese Empire, and there were a series of Sino-French conflicts over this issue. As usual in the 19th century, the European power easily won most of the battles, and won all the wars. In 1884 the French sank much of China's newly-built navy at its main base in Mawei. In addition to grabbing Indochina, the French took the Chinese city of Zhanjiang. Early in World War II, France was invaded and defeated, with most of the country directly occupied by Germany and the rest under a government based at Vichy, essentially a puppet regime. The Vichy government told its officials in Indochina to co-operate with Japan, and most did; Indochina was the main base for the Japanese invasions of Burma, Thailand and Malaya. When the Japanese were defeated, the French wanted their colonies back but their allies, especially the US, opposed that idea. Laos and Cambodia got independent governments, both of which soon had problems with local Communists backed by Moscow and/or Beijing. In Vietnam, things became much more complex. 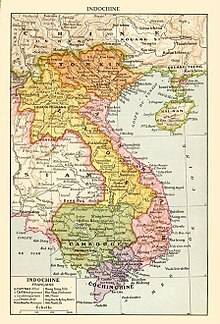 The Allies agreed that the Chinese (in the immediate postwar period, that meant the Nationalists) would administer the north and the British the south until a Vietnamese government could be set up; unfortunately both had other problems — a civil war in China and a major Communist insurgency in Malaya — so neither did a good job in Vietnam. The north ended up with the Soviet Union-backed Việt Minh (a Communist-dominated anti-colonial coalition) declaring independence while the south saw a return of the French. By 1947, the two were at war and after 1949, the Chinese Communist government gave the Việt Minh considerable support. The US supported France but President Eisenhower refused to send American troops. After the French lost the bloody Battle of Dien Bien Phu, the 1954 Geneva Accords ended that war. The accords again divided Vietnam, with the Việt Minh led by Ho Chi Minh controlling the north and the French the south, and provided for elections in 1956 to create a government for the whole country. The French turned power over to a United States-backed capitalist regime led by Ngo Dinh Diem in the south, which refused to hold the elections, resulting in another war. This time the United States stepped in to back South Vietnam, which they recognized as an independent country, even though the Geneva Accords included the statement "the military demarcation line is provisional and should not in any way be interpreted as constituting a political or territorial boundary". Thailand, known as Siam until 1949, was independent throughout the Colonial Age. This was partly because it had a strong monarchy and a substantial army, but also because it bordered both French and British colonies and neither power wanted the other to take Thailand. It collaborated with Japan during World War II by allowing the Japanese military the run of the empire in exchange for maintaining the trappings of independence, avoiding having its subjects forced or tricked into slave labor, and having its territory enlarged on paper by the addition of several former Thai vassal states in northern Malaya that were functionally under Japanese occupation. Following the war, Thailand became a U.S. ally and an important forward base for U.S. operations in the Vietnam War. From the 1960s to the 1980s, there was an unsuccessful Communist insurgency in Thailand. The Philippines also had important bases for the US war effort. While neither an official U.S. ally nor home to a U.S. military base, Singapore also played a significant role by allowing the American military to make use the local naval bases for resupplies. The Vietnam War had significant spillover into Laos and Cambodia, first through the "Ho Chi Minh trail" that was used by North Vietnamese smugglers to supply South Vietnamese communist forces and later when President Nixon decided to bomb those countries that had been officially neutral up to that point. In the course of the war and chaos, Cambodia was taken over by the "Khmer Rouge" as they came to be known in the West under Pol Pot, who perpetrated one of the most horrific genocides in history, killing roughly a quarter of the Cambodian population. Nonetheless, the West supported the regime despite its professed communism and it was the Vietnamese army that ultimately intervened, stopped the genocide and toppled the Khmer Rouge regime. The Vietnam War would eventually end with the Fall of Saigon on 30 April 1975, when a North Vietnamese tank drove into South Vietnam's Presidential Palace. This would spark off a massive refugee crisis as many of the ethnic Chinese and business-owning upper and middle class Vietnamese were targeted for purges by the communists, leading to the establishment of Vietnamese communities in the United States, Australia and Canada. As the American Civil War was the breakthrough of war photojournalism and telegraphy, World War I of radio and World War II of the newsreel, the Vietnam War was the first major war to be daily reported through television around the world. Photos and television footage from Vietnam have strengthened the anti-war movement in and outside the United States, and are held to have contributed to the American retreat, and the end of the war. The Vietnam War was also the last American war to date with active conscription. While most American soldiers on the frontline were volunteers, and a majority of the 2.2 million conscripts were deployed outside the theatre, the draft was a main source of protest against the war. The anti-war sentiment was one of the main issues for the 1960s counterculture. The Vietnam War also represents a turning point for Hollywood's depiction of war (and to some extent of Westerners' impression of war); while earlier American war films used to be patriotic, most films about the Vietnam War, such as Apocalypse Now, The Deer Hunter, Platoon and Full Metal Jacket are cynical and nihilistic. This travel topic about Indochina Wars is an outline and needs more content. It has a template, but there is not enough information present. Please plunge forward and help it grow!